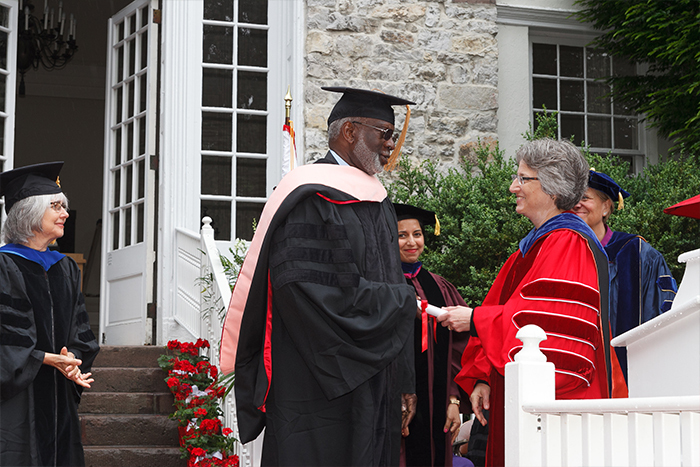 Former U.S. surgeon general David Satcher receives an honorary Doctor of Public Service degree at Commencement. Photo by Carl Socolow '77. David Satcher has served as U.S. surgeon general (1998-2002), assistant secretary for health in the Department of Health and Human Services (1998-2001) and director of the Centers for Disease Control and Prevention (1993-98). When he visited campus during Commencement weekend recently to accept his doctor of public health honorary degree, he sat down for an interview on the value of the liberal arts, the threat of the Zika virus and what graduates now take with them into the wider world. A physician-scientist and public health administrator, Satcher is the founding director of and senior advisor for the Satcher Health Leadership Institute at the Morehouse School of Medicine in Atlanta. But he emphasized that medicine alone hasn’t been the foundation for his remarkable career. Satcher says Zika virus disease is a threat that needs to be taken seriously and needs to be addressed swiftly and decisively. Carried by mosquitos and transmitted through their bite, Zika causes symptoms such as fever and rash in the general population but can have severe consequences for babies of mothers who contract the disease. Due to a surge in documented cases, in February the Zika virus was named a Public Health Emergency of International Concern by the World Health Organization.